Perhaps the first thing that will strike the viewer watching the new Errol Morris film is the verbosity of its title. The Fog of War: Eleven Lessons Learned from the Life of Robert S. McNamara takes the current trend of films with epic subtitles to new extremes, and not without reason. Most of the film is comprised of an interview with former Secretary of State McNamara, and divided into eleven chapters, each prefaced with a relevant “lesson”. During each of these chapters, Morris includes his typical visual flourishes and incorporates multimedia presentations of found footage from WWII and the Vietnam War. Rather surprisingly, though, the imagery that Morris intercuts with McNamara’s recollections with is almost always illustrative instead of skeptical. 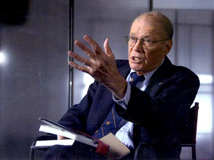 The director allows McNamara to present himself as a numbers man and an intellectual, and with that background established, McNamara begins to justify all of his admittedly incorrect decisions. As a result, we get strange juxtapositions such as the slick politician’s admission that he essentially acted as a war criminal during the WWII bombings on Japan followed by unsupported justification in which he claims in doing so he spared thousands of Allied troops’ lives. It’s an intriguing approach, because it never forcefully asks us to condemn McNamara, but it might not be enough for many. The film plays like a confession without the admission of guilt. Though it would be expecting a bit much to think McNamara would willingly reduce his place in history or gaze at his life with a truly critical eye, many might argue that Morris fails to fill this role when he doesn’t do so explicitly. Morris rarely challenges his subject directly during the interview process (and when he does, does it with a shout from off screen). Combined with the structure of the film, which divides the film into segments, each meant to impart one of McNamara’s “lessons”, this approach might make him feel too sagelike for the film’s good. One could easily suggest that McNamara himself has practiced nothing that he’s preached, and that the lessons are actually the values by which we should judge the subject and come to the conclusion that he’s lacking, but the passivity of the film makes it tough to commit to such a view. I imagine such contradictions would flit by the bulk of viewers, since to the somewhat passive (or politically biased) viewer McNamara does indeed exhibit candor. 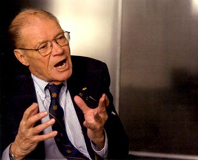 At the start of the film, and several times afterward, McNamara makes it clear to Morris and the audience that he is participating in the interview as a chance to learn from his mistakes and impart knowledge to the audience. One must wonder what percent of viewers will find it troubling when he doesn’t exhibit that kind of forthrightness at every opportunity. It seems, perhaps, that Morris wants to make his audience think that the more we hear about the situations the less we know about what really went on. He titles his film after a passage in which McNamara suggests the scope of war is so complex that no one man could ever take into account all of its variables. When his film had ended, however, I was left feeling that the more I heard from McNamara, the more I realized I wasn’t being told everything he felt. While that might be Morris’ main point, it ends up making the The Fog of War more about obstruction of the truth and the implied inadequacy of intellect than a probe of the worthy subject that it examines. Morris makes a move into the metaphorical and universal when specifics are what we want most. The mysterious, controversial figure predictably reveals himself as a canny politician, using the cover provided by his few truly confessional moments to mask a general unwillingness to explore uncomfortable territory, and Morris doesn't try to get beyond that exterior. Armchair philosophers might find some truths about human nature in this bait and switch, but to this viewer it was mostly the film's promises to stringently examine McNamara’s strategic decisions that left me feeling slightly slighted.